Click here to visit Prestige EVENTS' custom wedding and events website! You'll enjoy browsing our various photo galleries where we offer plenty of examples of our design work! Our florals will take your event to the next level on your big day. Highlight the theme of your big day with our linens and unique prop rentals. We offer hundreds of linens, in all different colors, fabrics and patterns that fit all budgets! From spotlighting, chandeliers and drop lights, in thousands (really!) of colors we’ll create the perfect ambiance to fit your elegant, romantic and intimate wedding. 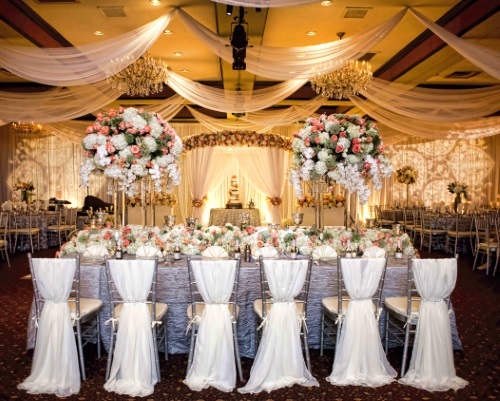 We offer many types of linen draping in multiple colors to enhance the theme of your wedding. We are the proud recipient of the 2012 and 2013 The Knot – Best of Weddings! We are pleased to announce that we have received the 2015 – The Knot – Best of Weddings!